La Nina is dead. Long live El Nino? A weather pattern known as La Nina that has worsened drought conditions across the U.S. Great Plains has faded, according to the U.S. Climate Prediction Center. But it could be replaced late this year by one called El Nino, which often roils agriculture and energy markets around the world. La Nina and El Nino are the terms used for fluctuations in ocean temperatures and atmosphere in the equatorial Pacific that can cause large-scale changes to the global climate. Conditions are now neutral, though the potential for El Nino has increased, according to the center in College Park, Maryland. The problem facing meteorologists is forecast models about El Nino and La Nina aren’t very good at this time of year. Many predictions about El Nino and La Nina made in the Northern Hemisphere’s spring have fizzled in the past, L’Heureux said. But La Nina probably won’t be coming back for a third year, and the chance of an El Nino forming between November and January is 49 percent, up from 48 percent last month. El Ninos, which occur when the ocean warms and the atmosphere reacts, can bring torrential rains to parts of South America, depress winter storm tracks through the U.S. and — if they arrive early enough — cut the number of tropical storms and hurricanes in the Atlantic. 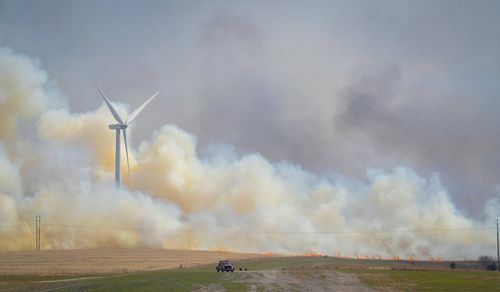 “At this time of year the false alarms of some of these models is fairly high this has to be taken into consideration,” L’Heureux said, adding that it gets easier around July and August. The last El Nino, one of the strongest on record, left farmers from Vietnam to Africa struggling with drought, triggered powerful Pacific typhoons and hurricanes and helped push the Earth into a series of its warmest years on record. There is a good pool of warm water across the Pacific, so if the atmosphere does edge toward El Nino “it has a good source to tap into,” L’Heureux said. The La Nina that just ended probably did play a role in the drought across the lower Great Plains, which has damaged hard red winter wheat throughout the region, L’Heureux said. Almost 89 percent of Kansas is dealing with drought, while just under half of Texas and Oklahoma were also struggling as of May 1, according to the U.S. Drought Monitor in Lincoln, Nebraska. Tuesday, the Australian Bureau of Meteorology also said the Pacific is in its neutral state and will probably remain that way into September.